This college is the best nursing college of Chhattisgarh. It is best in quality education and education atmosphere and promotes brotherhood among the students without any discriminations. Shri Chandra Nursing Institute is dream of Mr. M. L. Chandrakar and Mukesh Chandrakar. The college situated in Pushpak Nagar, Katulboard, Smriti Nagar, Bhilai, Chhattisgarh. lt is affiliated with Pt. 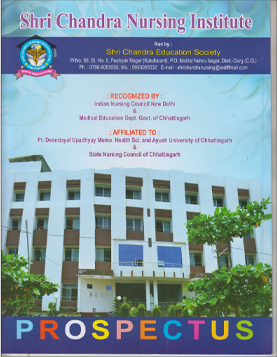 Deendayal Upadhyay Memorial Health Science and Ayush University of Chhattisgarh and recognised by Indian Nursing Council, New Delhi and state council of Chhattisgarh. At present Shri Chandra Nursing College (Inst.) which is the best nursing college of Chhattisgarh and also best nursing college of India is conducting B.Sc. Nursing 4 year course, Post Basic B.Sc. Nursing 2 year course, GNM 3 year Diploma course. Prepare a corps of well qualified nurse for leadership position to assume responsibilities in nursing and to do pioneer work of creative nature and scientific health care system. Enhance the knowledge and skill to respond the changing needs of the society. Demonstrate leadership and managerial skill in the clinical/community health setting. Develop expertise in rendering quality care to the individuals in hospital and community during health and illness. Demonstrates competencies to fulfill professional responsibility in independent and inter dependent function, in concern to primary health care. Use theoretical and empirical knowledge as basic in administrative, teaching and research function. Actively seek opportunities for professional development and continuing education. Enable them to get job opportunities for economically better position at national and international level. Utilize the latest technology in providing health care by conduction nursing research, interpreting and utilizing the finding from health related research. Demonstrative behavior that exemplifies professional nursing. Shri Chandra Nursing College (Inst.) offers the students excellent academic exposure through various continuing nursing education programmes, Conferences, Workshops and visits of eminent personalities. Library with large volume of books, latest periodicals. Fully Networked computer laboratory with broadband Internet connectivity. Fully equipped Nutrition, Fundamental of Nursing .Community .Midwifery & Child health Lab. Anatomy & Physiology, Microbiology, Biochemistry laboratories. Educational visits for professional training of students. Regular Special English Classes for Hindi medium students. Clinical experience at CCM Medical College & Hospital Kachandur, for community and mental Health Nursing in different areas. Students also participate in different national & international workshop & conference.